The blue wave that Democrats hoped would carry them to victory across the country may have largely skipped Arizona, as Republicans threatened to sweep statewide offices for the third straight election cycle. As expected, Gov. Doug Ducey cruised to victory in his re-election, trouncing Democratic nominee David Garcia by about 18 percentage points. But the GOP also prevailed further down the ballot, where Democrats had high hopes for a pair of statewide offices. At the end of the election night, the Democrats’ best chance for winning a statewide office was the race for superintendent of public instruction. Republican Frank Riggs led Democrat Kathy Hoffman by around 6,500 votes. Hoffman and Riggs traded leads several times throughout the night. 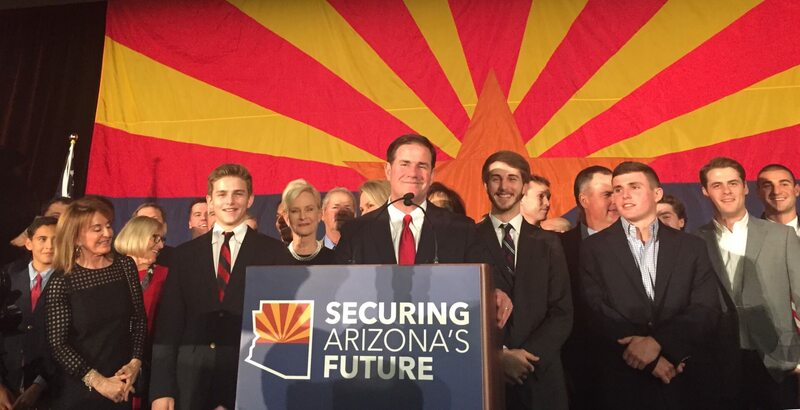 Ducey took the stage of the ballroom at the DoubleTree Resort in Scottsdale, where the Arizona Republican Party held its election night party, with a group of several young Republicans, his wife and Cindy McCain, the wife of the late U.S> Sen. John McCain. “If you voted for me, thank you. I hope you know I work for you,” he told an energetic crowd. He said he’ll be the governor for all the people, and struck a bipartisan tone. Ducey later told reporters he’s hopeful about the other statewide races where Republicans couldn’t pull through a definitive win in early results. Despite Ducey’s landslide victory, Garcia was upbeat as he addressed the crowd at the Renaissance Phoenix Downtown Hotel. Businessman Steve Gaynor led state Senate Minority Leader Katie Hobbs in the race for secretary of state by nearly 37,000 votes. The Associated Press called the race for Gaynor, but Hobbs ended the night declaring that it was too close to call. Garcia’s campaign was plagued by poor fundraising, and Ducey, the Arizona Republican Party and the Republican Governors Association combined to spend nearly $20 million on the race. Much of that went toward attack ads against Garcia, attacking him for his positions on President Donald Trump’s proposed border wall with Mexico and US Immigration and Customs Enforcement. Mark Brnovich dispatched Democratic nominee January Contreras, 53-47, to win a second term as attorney general. And Republican state Sen. Kimberly Yee easily defeated Democrat Mark Manoil to hold the Treasurer’s Office for the GOP. Yee is the first Asian-American elected to statewide office in Arizona. Democrats may still have cause for hope in the race for Corporation Commission, where former Commissioner Sandra Kennedy trails by just 22,000 votes. Incumbent Commissioner Justin Olson leads the race for two seats on the commission, while Democrat-turned-Republican Rodney Glassman is in second place. Gaynor, a political newcomer who spent more than $2.3 million of his own money on his campaign, is widely believed to have his eye on the Governor’s Office, which will be up for grabs in 2022, assuming Ducey finishes his term. And because the secretary of state is first in the line of succession to the Governor’s Office, Gaynor will benefit if Ducey leaves early. Four of the last nine secretaries of state have inherited the Governor’s Office through succession. If Ducey serves out the remainder of his term, he’ll be the first governor to both enter the office through election and leave at the natural end of a term since Gov. Jack Williams left office in 1975. The Arizona Democratic Party spent heavily on Hobbs, spending about $2.2 million boosting her campaign, even while withholding similar support for Garcia at the top of the ticket. The party received funding for its pro-Hobbs ads from iVote, a Washington, D.C.-based voting rights group that aims to elect Democrats in secretary of state races.